PPTminimizer is an application that compresses PowerPoint presentations and Word documents without zipping & unzipping. It is not freeware that costs $39.95 US dollars, but today we can get it for free. Actually, the steps are very easy. Just go to this page, fill your information, click "Request License" button. It will display user ID, registration code on another page. After that you can download application and install it. 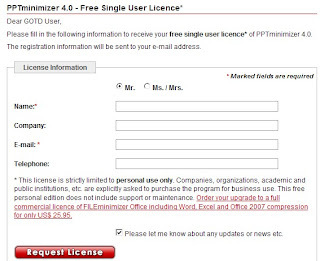 This promotion application is PPTminimizer 4.0.